Similar in size & layout to a hotel room. 1 queen & 1 single bed, kitchenette with microwave, fridge, toaster, electric frypan, separate bathroom, colour TV, fully air-conditioned. Rate is for 2 persons sleeping in the same bed. Extra guest $25.00 a night. Air conditioned apartment, self-catering kitchen, living area, colour TV, dining setting. Separate bedroom, 1 queen size bed & built-in robes.Single bed in Lounge some with sofa beds. Rate is for 2 on queen, maximum 4. Extra guest $25.00 per night. Features self-catering kitchen, living area with 3-piece lounge, double sofa bed, colour TV & separate dining. 2 bedrooms, 1 queen & 2 single beds/bunks or 2 queens, air conditioned. Rates for 4 people, maximum 6. Extra guests $25 per person, per night. 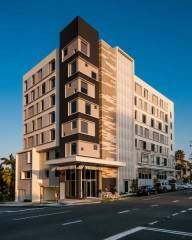 Situated in Southport, overlooking the glittering Broadwater, Harbour Side Resort offers 3.5 star rated affordable Gold Coast accommodation close to the region’s most loved attractions. 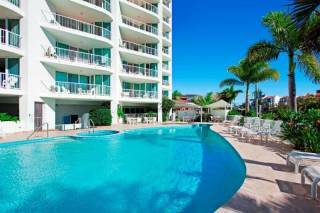 The resort provides a selection of one and two bedroom Southport apartments, ideal for families, couples, business guests and anyone looking for a peaceful break away from the crowds yet close to stylish Main Beach and Surfers Paradise. With a large pool, in-ground spa, shaded barbecue facilities and half sized tennis courts, all you need to unwind is right at your fingertips. We hope to welcome you soon! 1. No rubbish, Refuse butts nor any other items may be thrown or dropped from any balcony, door or window. When detected the Police will be called. Shouting from doors, balconies or windows not permitted. 2. No clothing, bedding nor any other article shall be hung or draped from balconies, doors, windows or on the outside of the building. 3. All rubbish shall be wrapped, tied and placed in the gargage bin at the rear of the complex. Bottles/boxes/glass/paper and other recyclables are to be placed in the recycle bins in the rubbish area. All rubbish my=ust be removed from units daily. 4. No excess noise from radios, TVs, doors slamming, voices etc to be made at any time within the unit or grounds and in particular on balconies when returning home late. After 10pm no noise to be audible outside the unit and if necessary doors & windows should be clased to ensure this. 5. All doors and windows shall be left securely fastened when the premises are left unattended and the management reserves the right to enter and fasten the same if necessary. 6. Only registered guests are permitted access between the hours of 8 pm and 8 am, outside these hours only 2 visitors per unit at any one time. Proof of identity to be made available at any time on request. 7. The swimming pool and spa etc shall be used only between the hours of 8:30 am and 9 pm. Alcohol not permitted in these areas or any foyers. No parties whatsoever permitted in any unit. 8. The barbecue area may only be used between the hours of 830 am and 9 pm and this is to be left clean and tidy. Check out time is 10am on the day of departure. Late checkout may be available at an additional cost depending on seasonal availability. Checkout after 12 pm will be a full day charge. Payments can be made by cash, bank cheque, money order, Mastercard or Visa. Please note credit card details or a cash bond is required on check in. 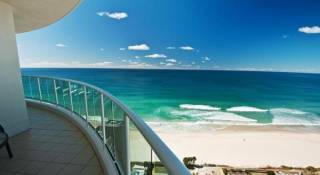 Shuttle bus services avaialbel from the Gold Coast airport to the resort. Just talk to the shuttle bus service desk at the airport to arrange transportation. There are express trains from the Brisbane airport to Helensvale Train Station. From Helensave Train Station take bus 704 to arrive at the entrance of Harbour Side Resort. Harbour Side Resort is located near the corner of North Street and Gold Coast Highway. 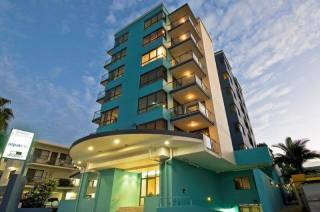 It is about 50 meters from the intersection of North Street and Gold Coast Highway. If you drive on Pacific Freeway take Exit 66 and follow Smith Street towards the end of Smith Street which is called North Street and turn left,Harbour Side Resort is about 50 meters away on the left hand side. We share the same driveway with Aqualine building.